For those unfamiliar with the work of Rooster Teeth Productions, Red vs. Blue - Recreation is the perfect place to start. The team’s most popular and widely-lauded creation, the Red vs Blue series is based on the Halo 3 videogame and follows the exploits of two teams of mechanoid soldiers and their often hilariously inept attempts to destroy each other. This latest instalment of the franchise finds the Blue Team consisting of just one man, the dim-witted Caboose, who isn’t going to let a few fires and explosions dampen his enthusiasm for his ‘special project,’ building a robotic body for one of his fallen comrades. Luckily for Caboose the Red Team are more interested in bickering than in ending their battle with the Blues, and as this seventh season progresses the war between the two teams becomes secondary to some hilarious subplots featuring gun-toting aliens, ‘suicide rescue missions’ and arguments as to whether or not disliking robots makes one a racist. 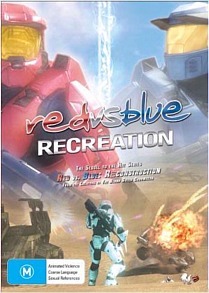 Red vs. Blue - Recreation contains all 19 episodes from Season Seven, edited into one 93-minute feature. As ever the machinima production values are superb, as are the vibrant colours and impressively crisp picture quality. The backgrounds are lush and finely detailed, and the majority of episodes feature funny, expansive and left of centre plot developments that will delight newcomers and longtime fans alike. The disc boasts a number of bonus features, including an audio commentary with Rooster Teeth mainstays Burnie Burns and Gavin Free, deleted scenes and outtakes; the release has been so crammed with content, in fact, that Burns was initially uncertain whether there’d be enough room on the disc. RT staffers Gus Sorola and Geoff Ramsey also make an appearance on the commentary track, and there are a number of Easter Eggs scattered throughout, adding further incentive to this already worthwhile offering. Al in all this is an excellent representation of the franchise, and further cements the Rooster Teeth crew as one of the boldest, most irreverent and most downright funny voices in American comedy at the present time.